Like anything else, publicity was essential to the concept's success. As we have seen already, Anthony Perkins played his part in making Terror on Church Street and other Pasaje del Terror attractions just that! Believe it or not, the photo below of the character holding a knife is actually the late, great Anthony Perkins. It was taken for the purposes of a promotional shoot for the Pasaje at Tibidabo Barcelona. "Orlando, FL. His unforgettable performance in Alfred Hitchcock's 'Psycho' burned the image of Norman Bates into America's collective psyche. 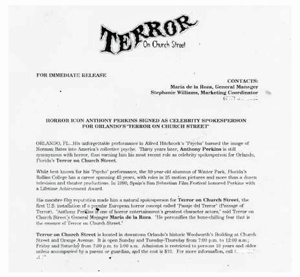 Thirty years later, Anthony Perkins is still synonymous with horror, thus earning him his most recent role as celebrity spokesperson for Orlando, Florida's Terror on Church Street. While best known for his 'Psycho' performance, the 59 year old alumnus of Winter Park, Florida's Rollins College has a career spanning 45 years with roles in 25 motion pictures and more than a dozen television and theatre productions. In 1990, Spain's San Sebastian Film Festival honored Perkins with a Lifetime Achievement Award. His macabre film reputation made him a natural spokesperson for Terror on Church Street, the first US installation of a popular European horror concept called 'Pasaje del Terror' (Passage of Terror). 'Anthony Perkins is one of horror entertainment's greatest character actors,' said Terror on Church Street's General Manager Maria de la Roza. 'He personifies the bone-chilling fear that is the essence of Terror on Church Street'. Terror on Church Street is located in downtown Orlando's historic Woolworth's Building at Church Street and Orange Avenue. It is open Sunday and Tuesday - Thursday from 7:00pm to 12 am; Friday and Saturday from 7:00pm to 1:00am. Admission is restricted to persons 10 years and older unless accompanied by a parent or guardian, and the cost is $10."